Prime Minister Ariel Sharon's government on Sunday approved an Israeli withdrawal from the Gaza Strip in principle, but a last-minute compromise with Cabinet hard-liners diluted the historic decision, leaving uncertain the future of 21 Israeli settlements. The wording of the decision was sufficiently vague to allow both Sharon and rebellious ministers from his Likud Party to claim victory. It deferred a political crisis, but did not resolve the deep divisions within Sharon's center-right coalition over the dismantling of settlements. Palestinian officials responded with skepticism. "If approving this fragmented plan took the Israeli government this long, I wonder how much time it will take to implement it," said Palestinian Cabinet minister Saeb Erekat. In a separate development, an Israeli court sentenced Palestinian uprising leader Marwan Barghouti to five consecutive life terms and 40 years Sunday for his role in attacks that killed four Israelis and a Greek monk — the maximum possible sentence. A defiant Barghouti, seen as a possible successor to Palestinian leader Yasser Arafat, was greeted by applause from his supporters as he walked into the courtroom, dressed in a brown prison uniform. He reiterated that he does not recognize the court's authority. 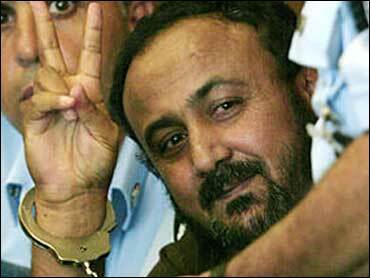 "The Israeli courts are a partner to the Israeli occupation," Barghouti said before the reading of the verdict. "The judges are just like pilots who fly planes and drop bombs." The three-judge panel sentenced him to five consecutive life terms for his involvement in attacks that killed four Israelis and Greek monk. He was also given two consecutive terms of 20 years each for a botched car bombing at a Jerusalem mall and membership in a terror organization. Israel says he played a leading role in Fatah's violent offshoot, the Al Aqsa Martyrs' Brigades, which has carried out scores of shooting and bombing attacks on Israelis during more than three years of fighting. Barghouti has defended attacks on Israeli settlers and soldiers in the West Bank and Gaza Strip, but has denied he was involved in violence. He is a longtime advocate of a Palestinian state alongside Israel and has said peace is possible once Israel withdraws from the West Bank and Gaza. In Sunday's Cabinet meeting, ministers were asked to approve a revised version of Sharon's U.S.-backed "disengagement plan," which calls for the gradual dismantling of all Gaza settlements and four in the West Bank by the end of 2005. A majority of Israelis back a withdrawal. The plan endorsed Sunday authorizes the government to begin preparations for the dismantling of settlements. However, Likud hard-liners attached a disclaimer, insisting that the vote did not amount to approval for taking down settlements. However, Sharon said after the meeting that "disengagement has begun." "The government decided today that by the end of 2005, Israel will leave Gaza and four settlements in the West Bank," Sharon told a large crowd of Jewish teens visiting Israel. Housing Minister Effie Eitam, who voted against the plan, said the bottom line of the vote was that Israel would dismantle the Gaza settlements. "No word laundry can bleach one of the blackest decisions ever taken by an Israeli government, which means expulsion of thousands of residents and the creation of a Hamas terror state," he said. A vote on the dismantling of settlements would only be held by March under the compromise, giving settler patrons in the government time to try to sabotage a Gaza withdrawal. It's not an unrealistic goal, since Sharon's government has been weakened by the withdrawal debate and there's talk about early elections by the fall. Sharon, formerly an erstwhile champion of settlement expansion, has staked his credibility on the withdrawal plan, saying it will reduce friction with the Palestinians and allow Israel to keep large settlement blocs in the West Bank. Sharon has forged ahead with the plan despite fierce opposition from many Likud politicians and two pro-settler coalition partners, the National Union and the National Religious Party. Sharon fired the two National Union Cabinet ministers on Friday to secure a one-vote majority for the Gaza plan. The National Religious Party was divided Sunday over whether to quit the coalition as well. If it does, Sharon would lose his majority in Israel's 120-member parliament, a further blow to the once popular leader. However, he appears in no immediate danger of being toppled. Sixty-one lawmakers are required to bring down a government, a majority Sharon's opponents are unlikely to muster. The first test will come Monday, when parliament votes on several motions of no confidence. Opposition to the withdrawal plan in Likud was led by three senior politicians — Finance Minister Benjamin Netanyahu, Foreign Minister Silvan Shalom and Education Minister Limor Livnat. Over the weekend, Sharon's aides held marathon negotiating sessions to bring the three on board, even though Sharon already had secured a majority with the dismissal of the National Union ministers. Sharon courted the three to avoid triggering an immediate rebellion in Likud, whose rank-and-file had rejected the withdrawal plan in a referendum last month. A compromise statement endorsed by the ministers said that "the Cabinet approved the revised disengagement plan, but this does not mean that it decided to evacuate settlements." The Cabinet said preparations could begin for the removal of Gaza settlements. "After completing the preparations, the Cabinet will reconvene to decide whether to evacuate settlements, how many and at what pace, based on the circumstances on the ground," the statement said. Vice Premier Ehud Olmert said the three Likud hard-liners made the most concessions. "A week ago they did not agree to a compromise that talked of three settlements, and today they agreed in principle to evacuation of all 21 settlements," Olmert said. Days of political wrangling watered down what could have been a dramatic decision by a hardline Israeli government to withdraw from a large chunk of land Israel captured in the 1967 Mideast War. Israeli troops withdrew from 60 percent of Gaza in the mid-1990s, as part of interim peace agreements with the Palestinians. However, during more than three years of Israeli-Palestinian fighting, Israeli troops repeatedly raided Palestinian-controlled areas of the strip. Sharon's "disengagement plan" was his first serious diplomatic initiative since he took office in 2001.